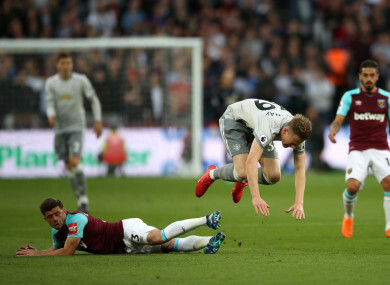 Manchester United's Scott McTominay (centre) and West Ham United's Aaron Cresswell battle for the ball . MANCHESTER UNITED SECURED second place in the Premier League with a 0-0 draw at West Ham on Thursday, but there was precious little else to please manager Jose Mourinho as the visitors again struggled for inspiration in attacking areas. United manager Jose Mourinho reacted to Friday’s meek 1-0 defeat at Brighton by making eight changes with Marcus Rashford and Anthony Martial relegated to the bench despite the continued absence of the injured Romelu Lukaku. Marko Arnautovic’s goals have kept David Moyes’s men up and the Austrian muscled his way into a good shooting position on six minutes but placed his shot too close to David de Gea. Arnautovic then headed another good opening over before United awakened from their slumber. Adrian has been restored in the West Ham goal for the past three games in place of England international Joe Hart, and showed why with a hat-trick of fine saves. Jesse Lingard was first to be denied with a fiercely struck long-range effort before Adrian showed quick reflexes to save from Alexis Sanchez and then get back on his feet to turn Shaw’s effort onto the post. Lingard stung the palms of Adrian again early in the second period. A lacklustre United display was reflected in Pogba again failing to take control of the game. The £89 million midfielder did have the visitors’ best chance when he headed wide just after the hour mark from Antonio Valencia’s pin-point cross. Pogba then sent an audacious effort from the halfway line well over Adrian’s crossbar to sum up United’s lack of ideas in attacking areas. However, the Frenchman did come a lot closer with his final strike that curled just past the post from a narrow angle. Pogba’s frustration then spilled over when he was lucky to escape with just a yellow card after grappling with West Ham captain Mark Noble as tempers flared in the latter stages. Email “Man United fail to beat West Ham but secure Premier League runners-up spot”. Feedback on “Man United fail to beat West Ham but secure Premier League runners-up spot”.